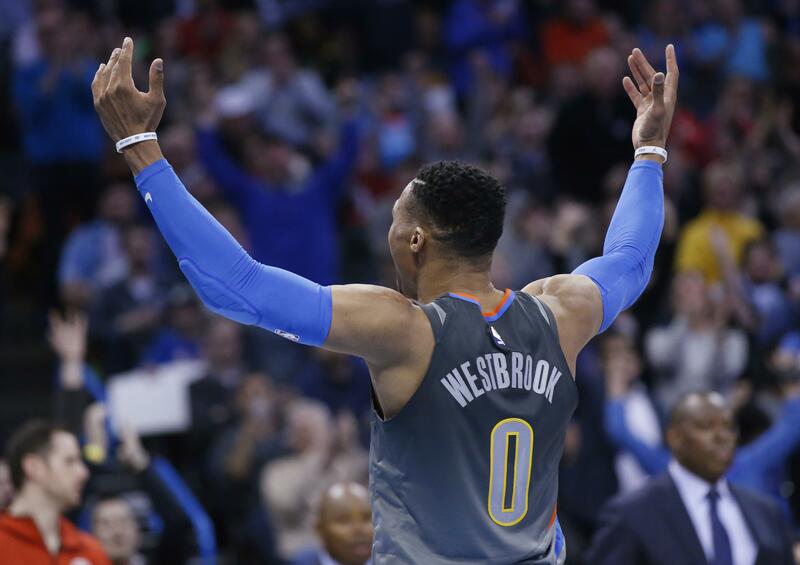 OKLAHOMA CITY – Russell Westbrook scored a season-high 46 points, and the Oklahoma City Thunder beat the Washington Wizards 121-112 on Thursday night for their sixth straight victory. Westbrook made 19 of 29 field goals in one of his most efficient shooting performances of the season. Paul George scored 18 points and Steven Adams added 12 points and 10 rebounds for Oklahoma City, which has won 20 of 28 after an 8-12 start. The Thunder shot 52 percent from the field. Bradley Beal scored 41 points and Markieff Morris added 20 for the Wizards, who committed 23 turnovers. OAKLAND, Calif. – Kevin Durant had 28 points, 11 assists and 10 rebounds, and Golden State made a season-high 21 3-pointers in a victory over Minnesota. Stephen Curry and Klay Thompson each added 25 points for the Warriors, who matched their previous season high of 18 3-pointers by the end of the third quarter. They made 57 percent from behind the arc in the game, with Thompson hitting seven, Durant adding six and Curry connecting on five. Durant hit two 3s and Curry added a third in a 67-second span late in the third quarter, during which the Warriors (39-10) went 8 of 11 on 3-pointers, leading Minnesota coach Tom Thibodeau to throw up his arms in frustration. Karl-Anthony Towns led Minnesota with 31 points and 11 rebounds. Jamal Crawford added 21 points and Jeff Teague had 17 points and seven assists for Minnesota, which played its fourth straight game without Jimmy Butler, who has a sore right knee. MIAMI – De’Aaron Fox’s rebound dunk with 3 seconds left capped a huge comeback by Sacramento, which rallied from a 12-point, fourth-quarter deficit to beat Miami. DENVER – Gary Harris scored 23 points, Trey Lyles had 21 and Denver beat New York. Published: Jan. 25, 2018, 10:57 p.m.